We created a wireless physical analytics system works with commonly available conductive plastic filaments. Our design can enable various data capture and wireless physical analytics capabilities for 3D printed objects, without the need for electronics. (1) We demonstrate room scale backscatter communication and sensing using conductive plastic filaments. (3) As shown in the image below, we enable data capture and storage for later retrieval when outside the range of the wireless coverage, using a ratchet and gear system. 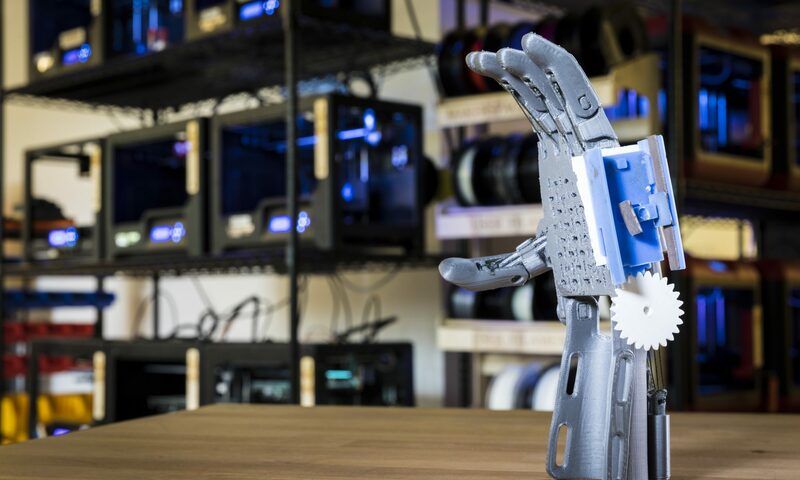 We validate our approach by wirelessly detecting the opening and closing of a pill bottle, capturing the joint angles of a 3D printed e-NABLE prosthetic hand, and an insulin pen that can store information to track its use outside the range of a wireless receiver.